New materials for ProJet 2500 and 5600 MJP are now USP Class VI and ISO 10993 certified material, enabling use in medical applications such as surgical guides. Approved materials include: M2R-CL (clear), M2R-WT (white), M2R-GRY (grey). The FabPro™ 1000 is an entry-level production printer created for engineers and designers, as well as jewellery artisans and fabricators. The FabPro 1000 easily fits on a desktop and delivers exceptional part quality and speed with lower total cost of operation. At less than £4,000, the FabPro 1000 is up to 4x faster and delivers up to 40 percent lower part cost versus similar solutions. Ideal for engineering and jewellery applications, the FabPro 1000 excels at low-volume, small-part prototyping and direct 3D production across a wide range of high-quality materials. Derived from 3D Systems’ proven metal additive manufacturing technology, the DMP 8500 Factory Solution is engineered for uniform, repeatable part quality and high productivity in metal 3D printing with a low total cost of operations (TCO). The DMP 8500 Factory Solution is comprised of function-specific modules designed to maximize efficiency by optimizing utilization. Each module within the factory solution is fully integrated with a Removable Print Module (RPM) which is vacuum sealable for a controlled print environment and engineered to move between printer and powder modules for a continuous production workflow. When it comes to production, repeatable part quality is essential. The RPM of the DMP 8500 provides consistent powder control, batch after batch to deliver scalable metal additive manufacturing. Featuring a vacuum chamber to ensure the lowest O2 content, the DMP 8500 printer module provides high quality 3D printed metal parts. Powder waste is eliminated, as the vacuum chamber guarantees consistent high material quality, sufficient to be used again and again. The modular design of 3D Systems DMP 8500 Factory Solution enables continuous function of all metal 3D printing and powder management modules to maximize uptime, throughput and operational value. The ability to match the number and type of modules required for your production workflow helps optimize your investment while minimal manual processes further reduce ownership and operational costs. With a large build volume (500 x 500 x 500mm) and high throughput enabled by multiple lasers, the DMP 8500 Factory Solution delivers high productivity in metal additive manufacturing. Paired with its modular design, scaling production is straightforward through the installation of additional metal printer and powder modules. The intelligent laser configuration and 3DXpert™ driven scan technology of the DMP 8500 Factory Solution enables the production of seamless large parts the size of the full build volume. This results in the highest surface quality for metal 3D printed parts with outstanding material properties. DENVER, Colorado, November 7, 2017 – Today, 3D Systems (NYSE: DDD) announced an addition to its line of leading Selective Laser Sintering (SLS) production systems with the ProX®SLS 6100, a next-generation printing platform that enables customers to seamlessly scale from functional prototyping to low volume functional production parts. By combining the printer, new materials, software and cloud-based services, this new solution addresses the majority of the plastic prototyping and production needs of the Automotive, Durable Goods, and Healthcare industries as well as satisfying specific needs for Aerospace interior cabin parts. The ProX SLS 6100 also delivers larger parts than small-frame systems, industry-leading total cost of operation (TCO) and is aggressively priced against similar printers in its class. DuraForm® ProX® FR1200 material delivers FAR 25.853 compliance, meeting the flame retardancy thresholds required by the Aerospace market for interior cabin parts. The material meets AITM Smoke Density and Toxicity Requirements, and its non-halogenated formulation has a favorable health profile. Parts produced with DuraForm ProX FR1200 possess excellent surface quality and a vibrant white color that cannot be attained with competitive materials making it ideal for post-processing and painting. DuraForm® ProX® EX BLK is a very high-durability nylon 11-based plastic derived from renewable non-petrochemical based resources. Tough enough to replace CNC/molded ABS and polypropylene, this material delivers functional production parts with high durability and impact strength, and excellent fatigue-resistance for long-term usage. The black color of the material eliminates the need for dying or painting. These properties make DuraForm ProX EX BLK ideal for short production parts that will see repeated use and wear, vehicle dashboards, grills and bumpers, and snap fit enclosures that will be subjected to repeated cycling. DuraForm® ProX® AF+ aluminum- and mineral-filled nylon 12 is ideal for production of high stiffness components that require heat resistance while under load (e.g., casings, covers and housings for motors, small engines or HVAC systems), as well as parts requiring an aluminum aesthetic. The material is optimal for applications in the Automotive, Aerospace and Consumer Goods industries to deliver functional production parts with smooth surface finish that are also suitable to many secondary processes such as drilling, polishing, and taping. The metallic finish also makes DuraForm ProX AF+ a good material for prototyping of bezels, buttons and knobs where a metal-like finish might be desired. With automated materials handling through the material quality control (MQC) system, the ProX SLS 6100 provides continuous automatic sifting and filtering with maintenance-free transportation of material to the printer. A new air-cooled laser eliminates the need for a chiller, delivering greater efficiency and lower total cost of operation. Finished prints feature a smooth surface, with the highest resolution and edge definition of any SLS system. 3D Systems’ 3D Sprint™ is an additive manufacturing software that prepares and optimizes CAD data and manages the SLS print process. The software includes tools for high-performance, high-density 3D nesting, quality checks for pre-build verification and a sinter cage structure generator, bringing high performance and productivity to the ProX SLS 6100 production process. 3D Connect™ Service provides a secure cloud-based connection to 3D Systems’ service for proactive and preventative support to enable better service, improved uptime and production assurance for systems. Through 3D Connect™ Manage, the user can also manage and monitor their equipment with anytime, anywhere access to their print jobs, system performance metrics and usage. Terms are payment with order. All items are one-offs, so are available on a first-come first-served basis. Prices quoted are only available for customers on the UK mainland. Machines offered with 12 month warranty. 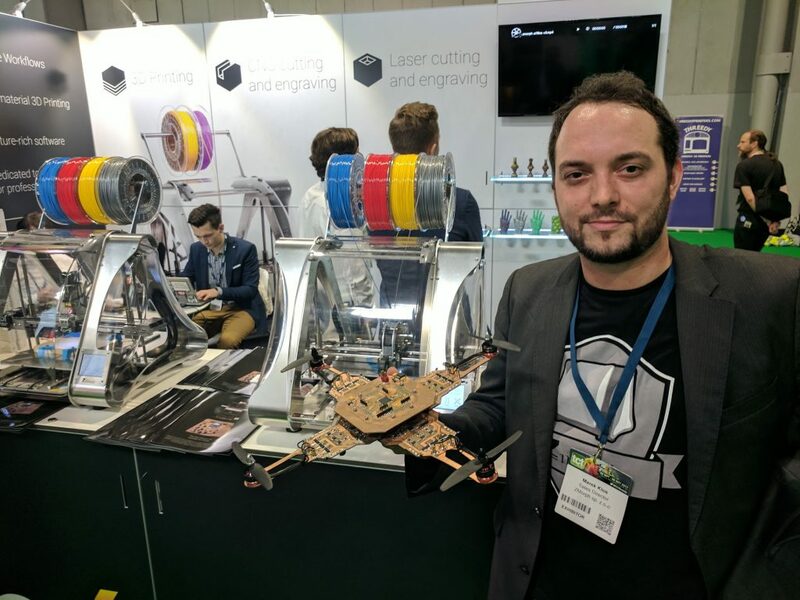 Pictured with a drone (including the PCB's) made using the ZMorph VX multitool 3D printer. Photo by Michael Petch.